7.5 inches long x 3.5 inches wide x 3.5 inches tall. The MyDog Collection is made up of 65 popular dog breeds, each meticulously crafted in stone resin and hand painted by our talented artists for unparalleled realism. 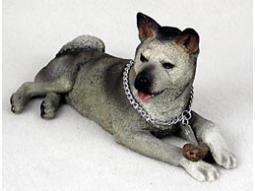 Each comes with a silver neck chain and a tag saying that's "MyDog". All MyDogs are individually boxed. Buy this item and earn 25 points valued at $1.25.